David Murray arrived back to Sydney yesterday Monday 8th September 2014 safe and sound. That was quite an achievement for a 69 year old cyclist who was nearly killed when he was side swiped by a semi trailer at Penong in 2012. The road from Canberra to Sydney was extremely busy with traffic and it kind of worried me for David’s safety at a couple of points. The Canberra Parliament Welcome organised by Senator Deborah O’Neill was so encouraging and to see all those political heavy weights turn out at 7.30am was so supportive to the Cyclist and the Singer fundraising program helping mine and agent orange victims in Vietnam, Laos and Cambodia. Lt Col Rob Moodie, military attaché New Zealand High Commission also attended the Parliament welcome. To top it off in Canberra was the greeting made by Sir Peter Cosgrove, Governor General of Australia. He was so hospitable and very interested in the concept “The Cyclist & The Singer” helping victims of war in Vietnam, Laos, Cambodia and other regions where our help is required. It was an honour to be offered a photograph in Government House with the GG. The journey from Ceduna to Sydney was quite interesting. As a Kiwi Vietnam veteran I got to experience to greatness of the small outback towns and the people were so hospitable. Standown Park situated at Goomboorian east of Gympie held an auction and MiVAC has benefitted. Pam Elkington wife of Rod (9RAR) won a bike that was donated on the night by one of the grey nomads. Google Standown Park website there is some great news and a great place to camp. I would recommend people visit these small outback regions the pies are great and the hospitality is even better. The flowers were in bloom and the wattle was so colourful. It reminded me so much of my friend the late Sergeant John Savage WW2 veteran who just loved the flowers of the wattle. The fields were covered with yellow canola flowers and it looked magnificent. The concerts we did along the way made the outback connection so much intimate with the locals. David Murray and I hope the publicity gained from this humanitarian “tour demine” across Australia will help MiVAC assist many families and disabled children who have been traumatised by mines and toxic dioxin chemicals used during the Vietnam War. I must congratulate my wife Janet for being so supportive and tolerant towards these two 69 year old Australian and New Zealand artillery Vietnam veterans. 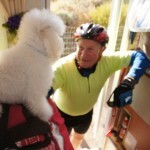 Mind you we cant forget Pebbles the poodle who greeted David Murray at every rest stop. I really enjoyed helping my Aussie mate and the experience gained was inspirational. Thank you to all those wonderful business people who offered FREE or reduced cost accommodation. ANZAC veterans and friends at Standown Caravan Park, Ceduna, Port Augusta, Port Broughton and other areas were very welcoming. Special thanks to our home hosts Laanie Sanders & Chris Barker in Murray Bridge, and Wendy Braniff in Canberra, John, The Radio announcer at Mona Vale & Gwynnie of Sydney sending texts, ANZAC support cyclists from Murray Bridge Derailleurs cyclist club who rode with David Murray from Murray Bridge to Keith, NZ artillery Vietnam veteran Geoff & wife Linda were at Ballarat and took us to see the worlds greatest circus.